There have been some big changes in the usual Fitness International lineup. It's an exciting time for upcoming competitors. Find out who's competing and who's likely to earn first place! This year's Fitness International competition is definitely one for the history books. For the past three years, Adela Garcia has been in the top spot of the Fitness International competition. But this year, she won't be back to defend her title. Last year's runner-up, Camala Rodriquez, has made the switch to Figure, and top-contender Myriam Capes was forced to withdraw due to injury. All these changes mean the field is wide open for a new crop of winners. Let the excitement begin! At last year's Fitness International, Bethany had one of her best shows. She finished in the top spots in both the physique and fitness rounds and earned fourth place. She was also runner-up at the 2012 Fort Lauderdale Cup. Bethany will definitely be in one of the top spots in the physique round, and if she brings a fast-paced, clean routine to the night show, she'll be a threat for first place. Regiane has one of the most ambitious routines of the group. If you're watching her, don't blink because you may miss her incredible flips and twists. Her biggest challenge is harnessing all that energy into a cohesive presentation. Her routines usually score high, but her physique keeps her at the bottom of the pack. If she can bring a more refined physique this year, she could be in the top six. Nicole Duncan has the potential to be great. We've seen her perform incredible routines—her background as a professional cheerleader definitely shines. However, she often misses the mark with her conditioning and ends up scoring lower than she should. To be in the mix, she needs to bring a conditioned physique and a high-flying, ham-it-up routine. I hope we see Nicole bring her best because she has the potential to win. Ryall earned third place at the 2012 Master's Olympia. It was a huge ego boost after her 10th-place showing at last year's Arnold. She has one of the best physiques in the field and should fare well in the physique round. The question is: will the judges like her routine? I enjoyed her Wonder Woman routine, but the judges were less than impressed. I see her being a threat for the top spots if she brings a routine that engages the audience and pleases the judges. Oksana is without question the woman with a target on her back. She won the 2012 Arnold and the Fort Lauderdale Cup. She was runner-up to Adela at the 2012 Olympia, and is now in the driver's seat. In the past, Oksana's routines were criticized for being too slow. She changed them to appease the judges and it paid off. The X-factor for Oksana is her posing. She can come in over-conditioned. She refined her physique and posing over the last two years, but has bordered "too hard" in the past. Fiona competed on this stage as an amateur just one year ago. 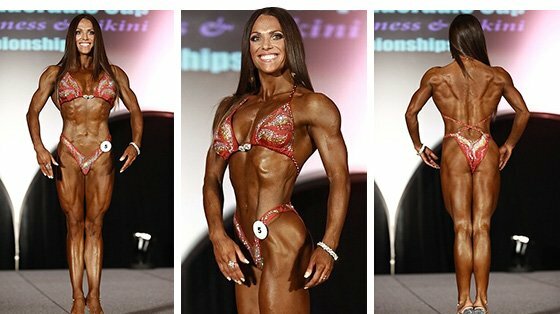 After she earned her pro card, she took the IFBB by storm. She finished third in her pro debut at the Pittsburgh Pro and matched that at the 2012 Toronto Pro. She grabbed fifth place at the Master's Olympia and is in a position to be in the top tier. To do it, she needs a controlled, energetic routine. She has the physique and the strength skills to do well; it's just a matter of refining them. In this group, Amanda is the closest to being a rookie. She turned pro at the 2012 NPC JR Nationals and has competed in just two pro shows thus far. She has a pair of seventh-place finishes. Any improvement in placing will be a victory. Her package just needs some fine tuning. A slightly more streamlined physique will help her move up in the ranks. Tanji is one of the veterans to the stage. She's often a crowd favorite. If she brings the physique and routine we know she's capable of, she could take the show. Tanji is consistently in the top five. You'd have to go back to the 2009 Arnold to find her any lower. We never know which Tanji will show up, but if it's the one with a tight physique and energetic routine, she could be shaking Arnold's hand at the end of the night. Kizzy is a bit of an anomaly. She's hit or miss with her tan, and we never know what color her hair will be. Sometimes, her physique flows well and other times it doesn't. She is, without question, one of the most flexible women in the IFBB Pro League and she demonstrates it in her routine. Some of her moves are like something out of a Cirque du Soleil show. One thing's for sure, you'll be gasping by the end of her routine. Trish Warren is coming back to the stage! After having a baby, she's ready to show everyone she hasn't skipped a beat. Trish refined her physique and improved her routines in 2011 which positioned her to be a top contender in the Fitness division. She was third in 2010 Olympia and matched that place at the 2011 Fitness International Contest. Regardless of where she finishes, Trish is a huge inspiration to mothers everywhere.